BEEP BEEP BEEP, a mystery solved! I hear it … my husband hears it … my dogs hear it. I reach for my left pocket where I keep my insulin pump … pull it out and check it. Nope, not the pump. I reach into my right pocket where I keep my CGM … pull it out and check it, expecting to see an alert. NOPE, not the CGM! I reach down to my sneaker, where I keep my Fitbit … pull it out and check it, even though it really doesn’t have an alarm … but I checked it anyway. NOPE, NOT THE FITBIT! I pick up my iPhone and stare at it. It appears to be in sleep mode but I checked it anyway. NO WAY, NOT THE CELL PHONE! My husband walked around me, like he was circling the wagons, trying to assess the beeping. As he paced around me, my 2 dogs slowly followed him around me. Then we took off, single file, in search of the BEEP BEEP BEEP. Out of the bedroom, across the hall, into my office, slowly, looking side to side and listening intently. There it was again … BEEP BEEP BEEP! We ALL looked up in unison. THE SMOKE DETECTOR! Aha! 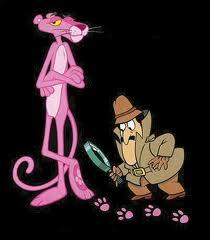 Great detective work, should have been set to music, a la the Pink Panther! Mystery solved!